RV cleaning is no fun for any of us! These big ticket items also come with big needs of care and maintenance. While in many ways RV's can be treated like over-sized cars with regards to cleaning and detailing, the biggest factor is the enormous size of RV's! Because of the amount of real estate these land behemoths consume, regular care and maintenance often go neglected. Hire an expert like myself. For many, the best day of RV ownership is the first and last day of ownership; this page is dedicated to making the time in between a little more enjoyable! 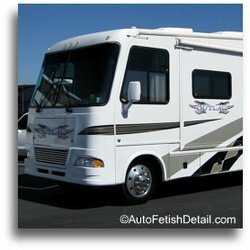 If you are looking to hire it out, you can follow this link to RV detailing of Orange County, CA. Having worked on hundreds of RV's, Motorhomes, Motor Coaches, and Toy Haulers over the past twenty-plus years, I am including this page of useful RV cleaning and maintenance tips. Not only will I be laying out specific tips to save you time and money, but actual products that will help you get professional results normally reserved for veteran detailers like myself. They need regular washing; dirt and sun are the biggest enemies. They all need some form of protection from the elements in the form of waxes or sealants. Follow along as I outline strategic tips of RV cleaning and maintenance for your new RV's, as well as the RV's that are looking a little rough around the edges. As any RV-er knows, these "toys" are big! 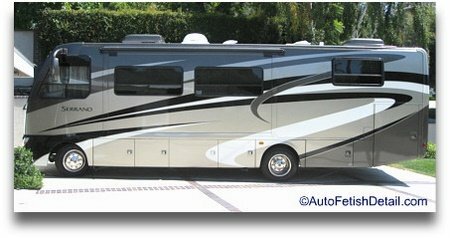 Washing your RV alone is problematic alone without even considering the waxing and detailing your RV. 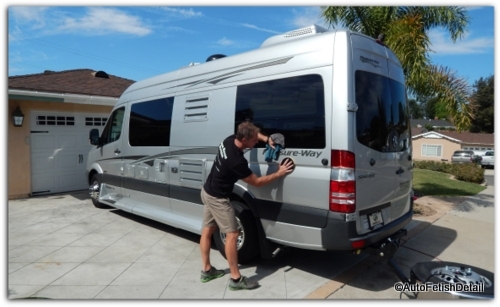 My experience has shown that a few common questions exist as to how to wash an RV or motorhome. The bigger the RV the bigger the hassle, and some professional tips will help to get you better results. Dirt and sun are your RV's worst enemies; respond accordingly. Most retail RV washing products are overly mild and will offer very little in the way of actual rv cleaning. RV wash and wax products are even more mild and recommended only on RV's in truly excellent condition. Do not use municipal water and allow to drip dry; the minerals in this type of water will create hard water spots that can etch into materials. If you are the proud owner of a brand new RV in excellent condition, or have the means to store your RV indoors, then you are ahead of the curve. Any quality car washing or RV washing product will suffice for basic RV washing. The higher-end RV's with full paint are especially suited for these types of products and will provide excellent results. Shopping for a multi-use product like a wash and wax will add even more visually fulfilling results. The above RV cleaning and washing brush is as good as it gets. It's not your only choice of course, but to me in my professional world, I simply love it for it's unique design that you will find effective, extra safe, and perfect for washing your RV. Brush head has bristles that surround entire head. (this makes for both efficiency and safety. On most standard brushes you will be bumping the brush head against the endless fixtures of your RV that might get damaged with traditional brush heads. Super soft bristles that are both effective and safe. Attach your hose to this extension pole and you are set with the most efficient RV cleaning wash brush and water hose attachment. There are endless RV cleaning wash soaps to choose from. Whether you are looking at dedicated RV wash soaps or traditional car wash soaps matters not. And for this reason I have chosen a highly rated car wash soap that also contains added gloss enhancers to add that extra zing to the appearance of your RV cleaning efforts. After all; if you are going to take the time to wash your RV properly, you might as well maximize your efforts! No harmful chemicals that will strip any wax or sealant you may have on your RV. Lubricants to help suspend and encapsulate dirt particles for super safe RV washing and cleaning. You're going to need a bucket to mix your RV wash soap in and use as you work around your RV during the RV washing process. Of course any bucket will work, but I like the branded bucket from Chemical Guys as it makes me feel like a professional even if you are simply a driveway detailer..or driveway RV cleaner in this case. There are numerous types of what has now come to be known as a grit guard insert that allows dirt particles to fall below this insert, thus allowing for safer washing. By adding this insert to the above wash bucket, every time you insert your wash brush for some new wash suds, the dirt particles from your wash brush can now sink below this insert and keep the heavier dirt particles separated during the RV cleaning process. Makes you wonder what took the industry so long to innovate what now seems like an obvious! And since this bucket dolly has the ability to lock the wheels, you have options in the event you are working on both flat and uneven terrain. It also brings your wash bucket up a few more inches from the ground that many find a little more useful. If you are still drying your RV (or car, or truck, or anything else for that matter) with an old bath towel you have hijacked from the house, you need to really catch up to the times. With this superior drying cloth from Meguiar's you can say good-bye to unnecessary scratching from your "safe" 100% cotton bath towels that are anything but safe. You can also say good bye to all the unwanted lint your bath towels leave behind when trying to dry your RV. RV's in general are BIG! A whole lot of real estate to clean, wash, and wax. If you have never experienced the benefits of water treatment systems like the CR Spotless filter when it comes to washing your behemoth RV then you are in for a real treat! No more water spots as you scurry around like a headless chicken trying to keep your RV from spotting up as you wash your RV. These water purification systems remove all the minerals in your water that create spots. These minerals often times will literally etch into the paint, fiberglass, windows, and even chrome to become permanent fixtures. With this system, you simply hook your water line to it and you are set for spotless RV washing. With all the minerals removed from your water supply, now you will not have to worry about racing the the clock, trying to manage the wash and rinse water during the process. And with the recommend wash soap from above, many RV owners simply wash and rinse with this spotless water treatment system and let their RV drip dry. It will not be as perfect as if you were still to take the time to dry off with a quality drying cloth like the one I recommend above, but when it comes to these rolling behemoths, many RV owners find this an acceptable trade-off. "Now that I have cleaned my RV, now I need to wax my RV." And since most RV owners recognize that basic RV cleaning and washing is part of the essential required maintenance, it is very likely that you yourself will also recognize the need to wax your RV at a minimum, and maybe even polish your RV. So if you have consumed all the information on this page as to what I recommend for RV washing and cleaning and are ready for the next step, then head over to my fiberglass wax page where I make all my professional recommendations for your RV when it comes to waxing and polishing. Start with the roof and work your way down onto the sides picking and finishing one side at a time until completion; this means both washing and drying one side at a time. Often people become overwhelmed at the thought of tackling RV cleaning, washing, and waxing all in one day. It is very doable to break down your RV into manageable sections of washing, waxing, and polishing based on your energy level and time constraints. As the saying goes, "You eat an elephant one bite at a time." So many find it less stressful to accept that maybe you will start out by simply washing one section of your RV a day, and do this until you have completed the project. Also note that many people accept that the roof is not visible from the ground and simply wash the sides of the RV only, and tackle the roof as you decide to tackle that challenge. I hope I have helped in adding the resources and information for you to not only take on this daunting task, but that you might also get better results with my recommendations!